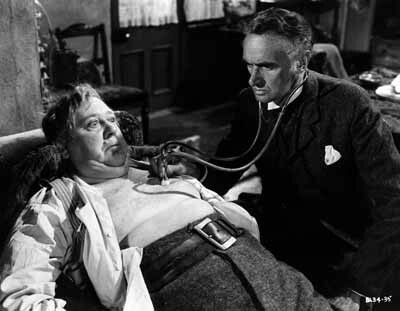 DOCTOR DOOM: Dr. MacFarlane (John Laurie) prepares to give Henry Hobson (Charles Laughton) the bad news in Hobson's Choice. ASHES OF TIME REDUX (2008). The motion picture as mood ring, Ashes of Time Redux is another Wong Kar Wei production that relies as much (if not more) on the sensations created by its aural and visual flourishes than on any narrative devices. Originally released in 1994 as Ashes of Time, the movie has since faced challenges both from within (a deteriorating negative) and without (bootleg copies all over the planet). Thus, the Hong Kong auteur decided to construct what's basically a "director's cut," and this tinkering has effectively brought the film back from the margins of Wong's canon. Leslie Cheung plays the central part of Ouyang Feng, a martial arts killer-for-hire who resides in a distant desert. Within the span of one year, he's visited by an assortment of allies, enemies and strangers – among them are a feuding brother and sister (both played by Brigitte Lin) who just might turn out to be the same person; a blind swordsman (Tony Leung Chiu Wai) prepared to go out in a blaze of glory; and a poor warrior (Jacky Cheung) who agrees to help a young woman (Charlie Yeung) out for revenge. Ashes of Time (and, by extension, Ashes of Time Redux) earned a reputation for shouldering an impenetrable narrative, but the truth is that the story isn't nearly as complicated as one might expect. Its denseness instead comes from the fact that it holds less interest to Wong than the images he creates for the screen. Through cinematographer Christopher Doyle's visions – and with a powerful assist from composers Frankie Chan and Roel A. Garcia – Wong wordlessly ensnares viewers in his movie's tightening web of wonders. DVD extras include a 14-minute making-of piece; a 42-minute Q&A with Wong Kar Wei; and the theatrical trailer. CHANGELING (2008). Like Mystic River and Flags of Our Fathers, Changeling is good, not great, Clint Eastwood, although as far as emotional resonance is concerned, this somber drama from the consummate director reverberates more strongly than either of those other features. A true story brought to the screen via an ambitious screenplay by J. Michael Straczynski, this stars Angelina Jolie as Christine Collins, a single mom whose only son (Gattlin Griffith) goes missing one afternoon in 1928. The Los Angeles Police Department, mired at the time in corruption, spots an opportunity to do something right and eventually reunites the mother with her boy. The only problem is that they bring back the wrong child, but rather than risk further embarrassment, a zealous captain (Jeffrey Donovan) decides to drown out Christine's protests by any means necessary, including labeling her as an unfit mother and having her locked up in a mental institution. Eastwood's stately picture slowly extends its reach, as various other plot elements circle the central story; while some suffer in the mix (John Malkovich, as a crusading reverend, could have benefited from more scenes), the overall result is a movie that will disappoint only those who require tidy endings wrapped up in pretty bows. Along the same lines, those who find fault with the brutish depiction of Christine's tormenters fail to grasp the patriarchy of the period (the story takes place a mere eight years after American women were given the right to vote). Jolie, on the other hand, understands this angle and aptly plays Christine as a woman whose frustrations with the system often match her fear for the safety of her child. She earned one of the film's three Oscar nominations, the others coming for Best Cinematography and Best Art Direction & Set Decoration. DVD extras include a 13-minute making-of featurette and a 5-minute piece in which Jolie discusses her character. 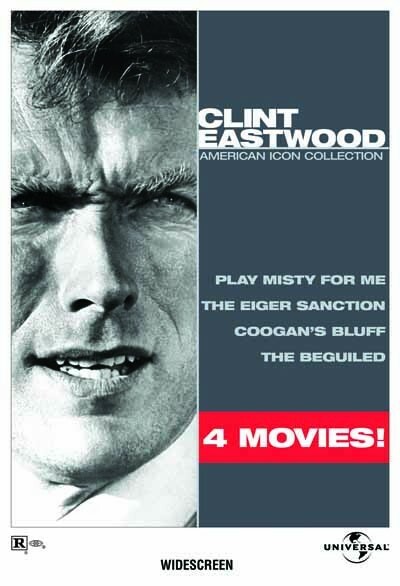 CLINT EASTWOOD: AMERICAN ICON COLLECTION (1968-1975). Changeling proved to be a critical and commercial underachiever for Eastwood, but that wasn't the case with his other 2008 effort. Gran Torino earned largely positive reviews and has grossed over $130 million, signaling that Eastwood's marquee luster still hasn't faded, despite decades in the business. Four of the superstar's past efforts have been packaged together in one set, yet while the box copy states that the films have been digitally remastered, the scant extras are the same ones found on previous editions. The enjoyable Coogan's Bluff (1968) finds Eastwood playing an Arizona deputy tasked to collect a prisoner (Don Stroud) in New York and bring him home; when the prisoner escapes, Coogan scours the Big Apple looking for him, much to the disapproval of an NYPD detective (Lee J. Cobb). This marked the first of several collaborations between Eastwood and his acknowledged mentor, director Don Siegel, and the film served as the basis for the McCloud TV series starring Dennis Weaver. The Beguiled (1971), also helmed by Siegel, ranks as Eastwood's most atypical picture from this period of his career (not surprisingly, it was a box office flop). Set during the Civil War, this intriguing drama finds him cast as a wounded Union soldier who gets nursed back to health at an all-girls Southern school. All of the women, from the middle-aged head of the institute (Geraldine Page) down to the precocious preteen (Pamelyn Ferdin), are drawn to the male in their midst, leading to jealousy, mistrust and violence. On the heels of holding his own against Shirley MacLaine in 1970's Two Mules for Sister Sara, Eastwood did likewise with the multi-Oscar-nominated Page, already demonstrating to his detractors that he did indeed possess acting chops. Eastwood made his directing debut with Play Misty for Me (1971), a nifty thriller about a DJ who has a one-night stand with an ardent admirer (Jessica Walter). But after he patches things up with his girlfriend (Donna Mills), the emotionally unbalanced fan flies into a psychotic rage, leading the DJ to fear for his life. The 1987 box office smash Fatal Attraction aped so shamelessly from this film that it's a wonder Eastwood didn't sue. In addition to being a commercial hit, the movie also propelled Roberta Flack's "First Time Ever I Saw Your Face" to the top of the record charts. Eastwood returned to the director's chair for the fourth time with The Eiger Sanction (1975), an underrated effort adapted from Trevanian's bestselling novel. The icon stars as Jonathan Hemlock, an art history professor who's also a former mountain climber and a retired assassin for a shady government agency. Hemlock is reluctantly dragged back into service to locate and eliminate a man working for "the other side"; since the target will be involved in a climbing expedition in the Swiss Alps, Hemlock's mountaineering skills will come in handy. Eastwood admirably did his own (dangerous) stunts in this Bond knockoff that showcases some spectacular outdoor footage and several memorable supporting characters. There are no extras on Coogan's Bluff. The only extras on The Beguiled and The Eiger Sanction are production notes and each film's theatrical trailer. Extras on Play Misty for Me include a 49-minute retrospective documentary; a brief piece in which Eastwood expresses his fondness for the DVD format; two photo galleries; and a poster gallery (in which early designs reveal that a possible shooting title for the picture was The Slasher). HOBSON'S CHOICE (1954). Director David Lean, soon to be making the leap from black-and-white, British-to-the-core dramas (Brief Encounter, Great Expectations) to color-saturated international epics (Lawrence of Arabia, Doctor Zhivago), keeps it compact with Hobson's Choice, a sharp comedy that features Charles Laughton at his blustery best. The incurable ham plays Henry Hobson, a boozy widower who lords over his bootmaking shop and his three daughters. The eldest, Maggie (Brenda De Banzie), is actually the one who runs the business and the household, and when she sets her sights on marrying the shop's best bootsmith, the timid Will Mossop (John Mills), all hell breaks loose. Watching Henry get repeatedly outwitted by his independent-minded daughter is just one of the many pleasures to be obtained from this delightful adaptation of Harold Brighouse's 1915 play, a stage staple that's been filmed no less than five times (including a 1983 TV-movie starring Yanks Jack Warden, Sharon Gless and Richard Thomas). The dialogue snaps, crackles and pops, and Lean's attention to detail is meticulous – even Will's awful haircut, appropriate for the character, will elicit some chuckles. The camerawork by Jack Hildyard (who would later win an Oscar for shooting Lean's The Bridge on the River Kwai) also rates a mention; note the inventive lensing during the inebriated Henry's nocturnal wandering. DVD extras include audio commentary by Alain Silver and James Ursini, co-authors of David Lean and His Films; the 1978 BBC documentary The Hollywood Greats: Charles Laughton; and the theatrical trailer. MILK (2008). The China Syndrome, Wall Street and even Casablanca are examples of movies that happened to be in the right place at the right time – that is to say, life imitated art (or vice versa) as each picture's release neatly dovetailed with real-life incidents that in one way or another mirrored what was happening on-screen. Milk follows suit: Although it's set in the 1970s, it couldn't possibly be more relevant; for that, we have to blame those hideous antigay measures that passed last November in California, Florida, Arkansas and Arizona. Back in the '70s, Harvey Milk (played by Sean Penn) fought against similar hysteria: Tired of homosexuals such as himself being treated as second-class citizens, he found himself drawn to political office as a way in which to fight for equality. Eventually elected to the San Francisco Board of Supervisors, he continued to grow in stature and influence, a career ascendancy which did not sit well with Dan White (Josh Brolin), the board's most conservative member – and, as it turned out, its most trigger-happy. The Oscar-winning 1984 documentary The Times of Harvey Milk offered a flawless look at the career of this passionate progressive, so it's a testament to the richness of Gus Van Sant's direction and Dustin Lance Black's screenplay that this fictionalized version feels authentic in its every movement. As Milk, Penn delivers the performance of his career, and he's backed by a superlative cast containing only one weak link: Diego Luna as Milk's insecure lover, Jack Lira (James Franco fares much better as Harvey's previous lover, Scott Smith). But this is a small misstep in an otherwise excellent production full of passion and purpose. Nominated for eight Academy Awards (including Best Picture), this won for Best Actor and Best Original Screenplay. DVD extras include four minutes of deleted scenes; a 15-minute behind-the-scenes featurette; and a tribute to Harvey Milk.